"Seattle Metro" redirects here. For public transit in Seattle, see King County Metro. A map of the Seattle MSA. 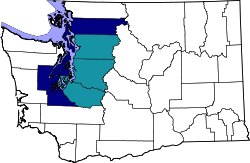 The Seattle MSA is highlighted in teal, the CSA in navy blue. The Seattle metropolitan area is an urban conglomeration in the U.S. state of Washington that includes Seattle and its surrounding satellites and suburbs. It includes the three most populous counties in the state—King, Snohomish, and Pierce—and is considered a component of the greater Puget Sound region. 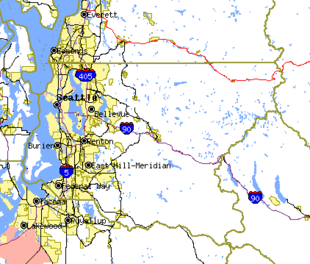 The United States Census Bureau defines the metropolitan area as the Seattle–Tacoma–Bellevue, WA Metropolitan Statistical Area. With an estimated population of 3,867,046 as of 2017[update], it is the 14th largest Metropolitan Statistical Area in the United States, with almost half of Washington's population. In 2010 the median income for a household in the MSA was $63,088 and the median income for a family was $76,876. The per capita income was $32,401. ^ a b Bureau, U.S. Census. "American FactFinder - Results". factfinder.census.gov. ^ "Religious Landscape Study". Pew Research Center's Religion & Public Life Project. Retrieved 2015-11-10. ^ Blethen, Ryan (March 4, 2019). "How the first day of commercial flights from Paine Field went". The Seattle Times. Retrieved March 8, 2019. This page was last edited on 12 March 2019, at 20:24 (UTC).